When something is commonplace, it is assumed to be safe – correct? Many people believe if whitening teeth were bad, someone would step in and stop the sale of bleaching products. The whitening industry has been growing rapidly over the past 10 years and currently generates over $11 billion a year. It is no wonder that we now have a huge turf fight, with dentistry trying to stop non-dentists from whitening teeth in malls and beauty parlors. Both sides are taking their cases to court, with non-dentists claiming that to make whitening a dentist-only treatment is giving dentists the monopoly in this lucrative business. You, my friends, have the teeth that everyone wants to bleach! It is interesting that both sides claim the risks from bleaching “are minimal”. The American Academy of Cosmetic Dentistry admits there is a problem of sensitivity after bleaching and hold this as one reason it should be a dentist-only treatment. The AACD admit that bleaching a decayed tooth can kill the nerve and result in the need for a root canal or extraction. I hope to help you get beyond the noise about who should get the money and help you learn the truth: the fact that researchers are ringing an alarm bell and telling us about the danger from bleaching teeth. But no one is listening– at least, not yet. A short time ago an Englishman was jailed for 16 months for selling tooth-whitening products that contained peroxide 103 times stronger than is allowed by the U.K. legal limit. The Irish Dental Association warns about tooth whitening and the European Commission has regulated the use of hydrogen peroxide to allow only qualified dentists to whiten teeth. Products containing more than 6% hydrogen peroxide are illegal to use in the U.K, even by dentists. 35% hydrogen peroxide is used in most US bleaching products, both in office and also in home-applied products. A 2012 study shows that this concentration of peroxide can cause changes in the tooth enamel that make it rough and a loss of strength and phosphate content in deeper layers. What this means is that the researchers saw molecular changes following the bleaching, and that it also had a dramatic impact on the inner live pulp. As a result of these findings, the researchers expressed concern about the common characterization of tooth whitening. They wrote: “despite reports that bleaching has been considered absolutely safe, analysis of our data shows that 35% H2O2 as a bleaching agent … can be clinically adverse in the long-term and/or after recurring bleaching treatments.” If you have read my chapter on whitening in Kiss Your Dentist Goodbye, you will be familiar with my warnings about bleaching which are similar. Another problem is that hydrogen peroxide (even at dilute concentration) may release mercury from silver fillings and cause them to deteriorate (possibly allowing toxins into your digestive system or body). At the end of every day, dental office waste drains are cleaned with a variety of different products. In 2006 a study evaluated these drain-cleaners, and one fascinating result of the study was that some of the cleaning products (including peroxide) caused mercury vapor to be released from discarded pieces of silver filling found down the drains. A more specific study should be designed before conclusions are drawn, but it seems important to know if peroxide causes deterioration of silver fillings. If you want naturally white teeth there are some important things to know. First of all tooth enamel has no color, it is translucent, which means that you can see through it like clear glass. Tooth enamel is not white, and the only way to make clear glass white is to etch, scratch, and abrade it. The color of a tooth is created by the way that light reflects off its surface. The structure at a microscopic level is a myriad of crystals packed inside a honeycomb of collagen. The more densely these crystals are packed, the more light reflects from the enamel, making the tooth appear whiter. If the crystal shape is spherical, as occurs when it forms under correct conditions, the tooth surface will be shinier and this makes the tooth appear whiter. So enamel crystals need to be densely packed and created in good conditions for teeth to appear whiter. Acidic conditions dissolve enamel crystals, and roughen the outer surface to make it thinner. When enamel is weak or thin, the underlying dentin shows through – giving teeth a yellowish or brownish tone. Drinking acidic drinks can make enamel weaker, especially if you sip acidic drinks. When teeth are weaker, they are more porous, and will appear darker in color. Any dark foods or drinks can stain softened teeth, which is why tea and coffee have the reputation for staining teeth. These drinks don’t stain strong hard enamel – but easily stain acid-softened teeth or teeth that have just been damaged by bleaching! Strengthen and protect your teeth from acidity and they will stay healthier, whiter and brighter. I recommend Zellies or some kind of 100% xylitol after meals and drinks to limit acidic damage from eating and drinking. Use the Zellies Complete Mouth Care System to help enamel become stronger and more acid resistant – so teeth of all ages will brighten and naturally whiten as they become harder, shinier and healthier – the exact opposite from the detrimental effects of whitening and bleaching! 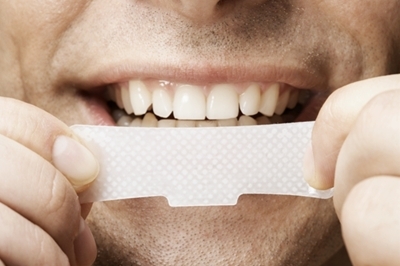 In most cases people see teeth whiten for up to 2 years on the System. this blog is timely for me. I will be getting a crown replaced next week and was planning on having it be a lighter color than the rest of my teeth so I could whiten my teeth in the near future and have it match. I have asked many dentists about negative effects of whitening. They all say it’s fine to do unless done too often. Is the major concern really with the high % systems or is it true for all whitening systems, even the low strength ones? My dentist suggested I get trays, low % gel, and only do it once a week or so until I reach the color I like. My other thought is that my teeth appear to have naturally lightened over the past year as I have changed my diet and some other habits. I’m wondering if I should give it another couple years on your system (just starting) to see my final natural color. It’s just that I want the new crown to match eventually! Thanks a lot for this website. Very, very helpful. Everyone’s teeth have a “natural” white, and this color is reached as teeth are healthy and fully mineralized. This is the color they will become when they are as strong as they can be. My teeth have never changed color, because I work to keep them fully mineralized. On the other hand, I know an 85 year old gentleman who has been using my system for the last 5 years, and now his teeth are “whiter” in color than they have ever been. He has old crowns at the back of his mouth that are yellow in comparison with his healthy front teeth! Yes, this system works for all ages, because it works by strengthening teeth. I wonder if there is there any way to wait at least 6 months before you have the crown made – and then match it to your teeth? If this was my mouth I would not bleach my teeth before having a crown made. I would not recommend bleaching for you, although the question is really what color are your teeth and can they be improved naturally? If you bleach your teeth, and then have a crown made, won’t you have to keep bleaching them to maintain this color? Be careful, especially if you are young. thank you for your reply and suggestions. I wasn’t able to wait to have the crown replaced (the tooth was painful). My dentist and I decided on a somewhat lighter natural color that blends in nicely with the rest of my teeth (this is a first molar but I got a huge smile…. :0). So hopefully, my other teeth will catch up within the next couple years without bleaching. The color of my teeth right now isn’t entirely terrible, but definitely on the yellow/darker side than most people have these days. My teeth have always been yellow (along with some fluorosis), since they erupted in childhood and this is affecting my self-esteem, unfortunately. Part of the reason for bleaching is to get a very prominent white spot (fluorosis) in my top central incisor to blend in a bit more. Think about what happens if you accidentally get bleach on colored clothes—why don’t you treat your teeth with as much care? Serious damage to your teeth is hard, sometimes impossible to repair, so why risk it when you aren’t 100% sure of what you are doing. Hi, just finding your blog. Great info. I am already doing a lot of what you suggest. But just as a point of curiosity, I thought that bleaches, at least the type you do laundry with, are caustic because they are very base? I also had another question for you! Do you know of any type of xylitol pastilles that have no added flavor, basically the xylitol equivalent of a sugar cube? I just like the natural sweetness of xylitol and would prefer that after meals instead of complicating the flavor in my mouth with mints or berry flavors, etc. Especially when you do it on a long-term basis, it would be nice to have something sort of neutral, as I’m not the type who normally likes sugar candies or mints or gums anyway. For now I’m using xylitol water, but little tablets would be more convenient. Hi Marcus and thanks for your comment. Bleach for laundry ( like Chlorox) is very harmful to teeth and should never be used. Some dentists use diluted Chlorox to clean inside a root canal – but it is never used in the mouth. You can eat xylitol crystals directly off a spoon – or dip a strawberry into the crystals as a great ending to a meal ( strawberries contain some natural xylitol – so they blend well). Zellies Cherry flavor Polar Bears are the most bland of all the Zellies products – and may be what you are looking for! Dr. Ellie what a wonderful blog and thank you so much for thist post! Im just finding your blog now and this is a wonderful informative site. I’m more in favor of leaving the bleaching process a dentist delivered service where we can supervise our patients. By providing the service, we are responsible for our patients and if sensitivities do develop, we can address the patients problems here at the office. If a patient has a problem with over the counter bleaching, they would more than likely have to visit their dentist anyways. This is definitely an informative post on the ins and outs of bleaching. And I will take full advantage of this new found knowledge. Sometimes bleaching becomes such a mainstay at the dental office, it is good to re-visit the studies and keep current on the effects to our patients. Thank you for your support and for being open minded. I have had such a struggle to explain what I do to my own peers! I think any doctor knows that they must help spread the science and help inform patients about any risks they are taking ( especially when the treatment is cosmetic). I worry a lot about the young kids and whitening. I think the cellular changes in the pulp tissue are worrisome – but especially when the patients are children with newly erupted permanent teeth. With what we know about stem cells in pulp tissue – I think systemic concerns should be taken very seriously. Children should start using xylitol, Crest Cavity Protection paste and ACT – even the whole system – as new adult teeth erupt. My kids used the system from 6 years of age – and their soft new teeth quickly became shiny and white. Another possible negatuve is for those who whiten too often. Hate to use the word addicted but its the best fitting. We have been following Dr. Ellie’s system for about six years now, and love it! My husband and I have improved our oral hygiene 100% by following the routine including the xylitol! The color of our teeth has improved as a result, and my sensitivity is totally gone! We would never return to the old way of brushing! Whether one has oral issues or not this is the only way to go! Thank you Dr. Ellie for all you have done for us and many others! That’s fascinating – I never knew that enamel wasn’t white! I generally avoid acidic drinks like the plague, but I do occasionally enjoy a lemonade. I think I’ll skip it from now on! So many things we eat and drink are acidic – skipping acidity is tough sometimes. This is where Zellies come to the rescue! Zellies is even more important if the acidic villain is our own saliva. For men, saliva can become acidic during serious events that create high levels of stress. For women a saliva pH change seems to happen more easily – sometimes even thinking about problems can change our pH! In all instances it is important to know that acidity is a risk for teeth. The good news is that we can take action. Zellies stimulates alkaline saliva and washes away acidity, to protect teeth. The system of care I suggest makes tooth enamel stronger and more acid resistant – so acid attacks will be less damaging. I am so grateful to have discovered you and your teachings recently– just before my dentist suggested that I fill the 2 small cavities that he found! They aren’t bothering me, and once I found out about your system and xylitol I was so eager to try it out! The progress is already showing as my breath is fresher and my teeth are brighter in only about a month. I will never go back to the old way of oral hygiene. I bought your book as well and it as taught me so much about oral health, and I try to share my knowledge with family and friends. Although I’ve always known that whitening teeth can’t be good for it, (like dying your hair will damage it and make it brittle) I would have never that whitening teeth could be this damaging to the enamel! Companies seem to trick us into thinking that stains are being “safely lifted off” but that is not the case. It makes me hesitate to continue using my expensive whitening product that I’ve bought not to long ago (before I learned about the dangers of whitening) called the ZERO White Teeth Whitening Pen made by Whitening Lightning, Inc. I’m not sure if you are familiar with this product or the company but this one caught me because it seems to be the safest of all the whitening products on the market. I quickly looked up the ingredients used because although they claimed to be “all natural botanical whitener” I knew that had to be a lie. I was wondering if you could give me your opinion on the safety of this product from it’s ingredient list? I guess I’m just in denial of trashing this product since it was expensive and recently bought. Gahhhh! Thank you so much Dr. Ellie for everything that you do! Thank you for your message. I am very happy you are now empowered about your oral health. It appears you have cavities that are in the process of healing, so you must avoid products that contain glycerin – something that appears to interfere with remineralization and cavity repair. I am also concerned about baking soda (sodium bicarbonate) which is the second ingredient in your whitening product. The problem with sodium bicarbonate is that it appears to strip teeth of a layer that is important for repair (the Pellicle layer). Think of Pellicle as a magnet – a thin protein layer that attracts calcium and phosphates to the surface of teeth – where they strengthen (and whiten) them. I suggest you put this whitening product away for now. I’d suggest you concentrate on repairing these cavities until they are declared totally healed by your dentist. Then (maybe) before a special event or party, you could try this whitening paste again. Now you will be able to determine how your teeth “feel” when using it. I certainly do not suggest you use it now, because it may interfere with healing your cavities. Sorry – I know its hard to put an expensive product aside and stop using it. I make this same suggestion to everyone who has a “favorite” toothpaste or “rinse” that they love for some reason. I suggest they use the Complete Mouth Care System (including Zellies mints and gum) exactly as recommended for 6 months. Then they can return to the old “favorite” and make the comparison in how their teeth feel. Think about what you will save on dental treatment in the long run – I am sure it will compensate for the cost of any “expensive” or “favorite” product! I have never tried bleaching my teeth and would never do it. Thanks for sharing this interesting article. Now i know the many negative effects of bleaching teeth. I didn’t know that about enamel not being white! Amazing! After not going to the dentist for a ling time (too many trips as a kid) I now take even better care than ever. Glad I found your articles here, learning so much. Sugar and other versions of, are now the enemy. Not just for teeth. health in general. Food and drinks companies have a lot to answer for, especially the stuff the market towards kids. Marketing surrounds us all with bad information! I agree that most drinks are evil for teeth – but many people are surprised to find that there are bad toothpastes, acidic mouth washes ( especially some that are sold for dry mouth), bad medicines, and lots of bad information about food. This is interesting – I didn’t realise how much damage teeth whitening kits could do. It’s sad that people are not more aware of the issues. Given the fact that many kits are so inexpensive and so widely available means people are unlikely to do the proper research before using. Just found your blog by the way! Thanks and I’ll keep on following! Just wanted to post an update on this amazing system. My teeth are almost completely clear of yellow staining and are looking healthy, shiny and almost pearly white!! I’m about 3 months into your program and can’t thank you enough. My dentist was amazed at how clean an healthy my teeth and gums were. Just wanted to write an update on this amazing system. I’ve been using it for about three months now and my dentist said my teeth were extremely clean and very healthy! On a plus point and something I am very excited about is that my teeth are very clearly going from being stained yellow to pearly white. I cannot believe the difference. Thank you so much for this program! I ordered this whitening kit for my teeth from GRACEFULGRINS & I noticed in the ingredients it has Polysorbate 20 and I was watching a video about it being in hair products and it wasn’t good it can cause cancer and immune system problems and so on and I just got the package today and was planning on using it but is safe for my to use for my teeth it’s also vegan friendly. As for tooth whitening, if you understand tooth enamel is actually translucent glass – you see that the idea of whitening teeth is a brilliant marketing choice of words. In almost every case, these products damage or weaken teeth.